Today we had nothing really planned. Not that we had to get up for. Went across the road to the Mall and had waffles for breakfast. After having breakfast we came back to the hotel to research and try and buy tickets for Alantis. It is the hotel out on the original Palm Island and also has an aqurium and a water park. We also tried to book online tickets to the Dubai Ski. However we were not able to do so. Would not let us book for the same day. We decided to just go across the road and try directly. 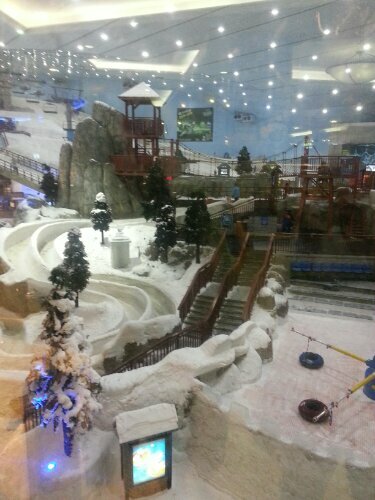 When we got to Dubai Ski we were able to buy tickets to the snow park and to meet the penguins. We had booked the 4:30pm tickets to meet the pengiuns but the guy had given us the 4pm tickets. This had caused some confusion because when we tried to enter they sent us across the the pengiun encounter meeting point. The lady there knew we were doing the 4:30pm session so we went back and explained it to the other lady at the gate. Even after entering the park the guide wanted us to join the 4pm group. Since the group was large already we didn’t want to and said we would meet at 4:30pm. By now some time had gone by and we only had 15 minutes to go explore the snow park. Rhian and I went on the tabogan down the bobsled strack. Went for a quick walk around the rest of the park before heading back to the pengiun encounter meeting point. We seemed to wait around the meeting point within the cold side of the gate for a long time. Just as we were going back out to see if we were meant to meet at the warm side the leader was bringing through the rest of the people. We first watched a short video of the rules of meeting the pengiuns. After this we had to clean our hands before being lead into the penguine meeting point. There was a trainer and one Gentoo penguine called Lollypop. Lollypop was only two years old and so was easily excited. In pairs we were told to go site across on a chair. The penguin would then run across the floor and waddle up a ramp and come stand in the middle of the pair. You then posed for photos for the photographer. After the photos the penguin would run back to the trainer for its fish. After Lollypop we were lead into a second enclosure where there were two king penguins. King penguins are the second largest breed of penguins. In this enclosure again in pairs we were told to kneel behind the pengiuns. We were then told to touch its back. Stroke its fins. Then we were shown how to hug the penguine. lastly you leant forward and kiss the penguine on its neck. All the time the photographer was taking photos. You only got a short time with the penguins and our time was up. 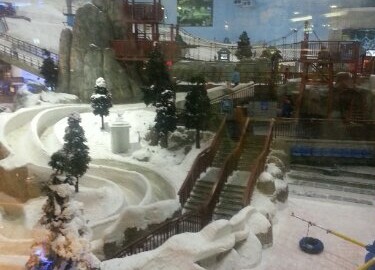 We left the cold side of the ski park and went back inside to view the photos. Rhian and I ended up buying all our photos on a USB drive to bring home. After buying the photos we went back into the ski park to play. We caught the chair lift half way up the hill to the cafe. At the cafe we had nachos and a mocha. Instead of taking the chairlift down we put helments on and rode tubes down a longer bobsled track. Rhian enjoyed this so we caught the chairlift back up the hill and went down again. After this Rhain went to play on the kiddy rides and I lined up to go on the Zorb ball. It is a big ball inside a ball. You jump into it then roll down the hill. This was fun but the hill was only about 15 meters. After the Zorb ball I went and found Rhain again. By now it was getting late and we were frozen enough so we exited the Ski Park. After taking the boots, pants and jackets off we left Ski Dubai. We went to dinner at the mall at one of the restraunts then came back to the hotel. Again we researched Alantis and tried to book online. Didn’t work still and after not hearing back from the travel company Rhian stuffed around on the tablet. I was watching TV. After Rhian finished playing I tried one more time to book our tickets for Alantis and this time it worked. Rhians phone had used up all our data at dinner so we made plans to get to breakfast early. Go to the mall to top up the data, Get Rhian some more bathers then head to Alantis. I spent the rest of the night writing blogs. Rhian started watching a movie which didn’t finish until 2am. I told her she would have to turn all the alarms off in the morning. Rhian hates the mornings and hates waking up.